Difference between revisions of "Catabaptist"
The exhaustive discussion of the meaning of the word by [[Blanke, Fritz (1900-1967)|Fritz Blanke]] in the commentary to Zwingli’s <em>In Catabaptistarum strophas elenchus (Huldreich Zwinglis sämtliche Werke </em>VI, 21-22, Leipzig, 1935?) points out that Oecolampadius first proposed it in a letter of 12 October 1525 to Zwingli, taking it consciously from a fourth-century writing of Gregory of Nazianzus, recommending that it be used in place of "Anabaptist," which had already come into use. The most prominent use of the word is in Zwingli's 1527 <em>Elenchus. </em>The word is actually used in essentially the same meaning as "Anabaptist," that is, rebaptizer, but carries the additional connotation of "anti-baptist," that is, attempting to destroy the true baptism. Schijn considered "Catabaptists" the best designation for the Anabaptists, explaining that "kata" means to act in accord with true baptism; he approved it because the Anabaptists act according to Biblical doctrine, that is, they practice baptism Scripturally. Hege, Christian and Christian Neff. <em>Mennonitisches Lexikon</em>, 4 vols. Frankfurt &amp; Weierhof: Hege; Karlsruhe; Schneider, 1913-1967: v. II, 469. Hege, Christian and Christian Neff. <em>Mennonitisches Lexikon</em>, 4 vols. Frankfurt &amp; Weierhof: Hege; Karlsruhe: Schneider, 1913-1967: v. II, 469. Schijn, Hermann. <em>Geschiedenis dier Christenen, welke in de Vereenigde Nederlanden onder de Protestanten Mennoniten genaamd worden : in welke, benevens derzelver oorsprong, voortgang, hedendaagschen staat, en belydenisse des geloofs, ook het groot onderscheid tusschen hen, en de hoogduitsche, en Munstersche Wederdoopers aangetoond word: waar by noch komt een naukeurig onderzoek wegens de oudheid van den doop der Jooden-genooten onder de Jooden. </em>Te Amsteldam : By Kornelis de Wit, 1743-1745: XCVII-CI where Fred Spanheim in <em>Elenchus Controversiarium </em>(1694) p. 86, is also cited. 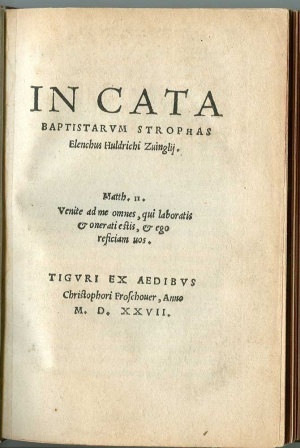 Catabaptist, a name used for a time (1525 and following) for the Swiss Anabaptists by Zwingli and Oecolampadius in their Latin writings. It did not, however, succeed in displacing "Anabaptist," which became the standard term. It is an original Greek word translated into Latin, not found in German or English. The exhaustive discussion of the meaning of the word by Fritz Blanke in the commentary to Zwingli’s In Catabaptistarum strophas elenchus (Huldreich Zwinglis sämtliche Werke VI, 21-22, Leipzig, 1935?) points out that Oecolampadius first proposed it in a letter of 12 October 1525 to Zwingli, taking it consciously from a fourth-century writing of Gregory of Nazianzus, recommending that it be used in place of "Anabaptist," which had already come into use. The most prominent use of the word is in Zwingli's 1527 Elenchus. The word is actually used in essentially the same meaning as "Anabaptist," that is, rebaptizer, but carries the additional connotation of "anti-baptist," that is, attempting to destroy the true baptism. Schijn considered "Catabaptists" the best designation for the Anabaptists, explaining that "kata" means to act in accord with true baptism; he approved it because the Anabaptists act according to Biblical doctrine, that is, they practice baptism Scripturally. Hege, Christian and Christian Neff. Mennonitisches Lexikon, 4 vols. Frankfurt & Weierhof: Hege; Karlsruhe: Schneider, 1913-1967: v. II, 469. Schijn, Hermann. Geschiedenis dier Christenen, welke in de Vereenigde Nederlanden onder de Protestanten Mennoniten genaamd worden : in welke, benevens derzelver oorsprong, voortgang, hedendaagschen staat, en belydenisse des geloofs, ook het groot onderscheid tusschen hen, en de hoogduitsche, en Munstersche Wederdoopers aangetoond word: waar by noch komt een naukeurig onderzoek wegens de oudheid van den doop der Jooden-genooten onder de Jooden. Te Amsteldam : By Kornelis de Wit, 1743-1745: XCVII-CI where Fred Spanheim in Elenchus Controversiarium (1694) p. 86, is also cited. Bender, Harold S. "Catabaptist." Global Anabaptist Mennonite Encyclopedia Online. 1953. Web. 24 Apr 2019. http://gameo.org/index.php?title=Catabaptist&oldid=106752. Bender, Harold S. (1953). Catabaptist. Global Anabaptist Mennonite Encyclopedia Online. Retrieved 24 April 2019, from http://gameo.org/index.php?title=Catabaptist&oldid=106752. Adapted by permission of Herald Press, Harrisonburg, Virginia, from Mennonite Encyclopedia, Vol. 1, p. 524. All rights reserved.